On this page, I detail how to service Treble-O-Lectric locomotives. I had only American prototype units for many years but I have recently acquired both the D.5000 and D.5900 (I am thrilled, to say the least) and the construction of all of the diesels is basically the same. The Baldwin 0-8-0 is the only steam locomotive in the range. For a brief discussion about how an electric motor operates, please go to "The Rivarossi Motor" page off the home page or selectable at the bottom of this page. through screw to hold the motor together. Through experimentation, I have determined that a typical Treble-O-Lectric diesel loco should be able to pull at least six American outline Treble-O-Lectric freight cars around a level oval of track without too much effort or slipping and maybe even as many as eight or nine cars. Of course, the Baldwin 0-8-0 may be expected to pull a bit less because the tender drive has to push the locomotive too so, perhaps one or two cars less. I have recently acquired British outline wagons and the number that can be pulled is not much different from that of the American outline. Even though these wagons have only two axles as opposed to the American outline four, it seems the rolling qualities are not quite as good, at least with the ones I have. This may be partly due to the British wagons having the metal-ended axles. I also noticed that my British wagons tend to roll dog-legged through curves with the leading end toward the outside rail and the rear against the inner rail. This is probably due to the wagons not having swiveling bogies and it undoubtedly adds friction too. Actually, it seems I can see this at some times and not others so maybe it's my imagination. Or maybe it has to do with how well I keep them lubricated. Any fewer cars than six almost surely indicates that the driving bands are stretched or worn, assuming that the rest of the mechanism is in good shape, the driving wheel journals are clean and lubricated, and the motor is up to snuff. Of course, the driving wheel journals would be something you would want to inspect at intervals, especially when replacing driving bands. It is a good idea to clean and relubricate the journals and axle ends at this time. 90% isopropyl alcohol works well for cleaning these parts and a light grease such as LaBelle 106 with Teflon should be used for lubrication. Oil could also be used but it may require more frequent applications as oil will have more of a tendency to be flung off or evaporate. Removing old lubricant from the chassis motor shaft support bushings before removing the driving bands, cleaning, and replacing the lubricant after the driving bands have been replaced is also good. I do it in this order to avoid getting grease on the bands when slipping them over the shaft. Use the same type of grease as used in the driving wheel journals. Of course, the obvious thing to check here is the driving wheels which also pick up current to run the motor. They should be a nice, shiny brass colour on the driving surfaces. Clean as necessary. If the wheels are clean and in good shape, the driving bands OK, and the wire leads intact and connected, about the only other cause of poor running is the motor itself. 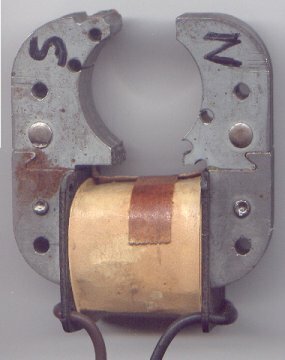 There is a particular symptom indicating a detached commutator connection on the armature. If a loco starts sometimes but not others and if it does start doesn't have the expected power, a.detached winding is indicated. The loco may also just sit and hum. Assuming no binding to the point of locking the motor shaft, it is most assuredly time to disassemble the motor for inspection (see "Motor Inspection" below). Another cause of a motor not performing to expectations is motor brushes worn to the point of poor contact with the commutator copper segments. This is easily determined by moving the armature back and forth and watching the brush springs. When the armature is moved toward the brush springs, they should be forced further away from the end cover by the brushes themselves, indicating that there is sufficient length to the brushes. New or fairly unworn brushes will cause the springs to be a considerable distance from the cover to start with. As the brushes wear, of course, the springs will move closer to the end cover. If the brushes are worn to the point of the springs resting against the cover or if the springs stay against the cover when the armature is pushed toward them, the brushes are too short and must be replaced. Even if the brushes are not too worn, they and the commutator segments may have become contaminated by dirt or oil caused by excess lubrication. The result, of course, is also balky performance. This can usually be remedied by disassembly, cleaning with alcohol, and reassembly. If the brushes have become too oil-soaked, however, replacement may be called for. The noise level of Treble-O-Lectric locos is somewhat variable what with the motor allowed to freely vibrate against the metal chassis and shell. My two British outline diesels seem to be generally quieter in this regard than my American prototype locos. However, this should really be the only apparent noise and even this can be reduced by the careful placement of cardboard or cloth between the motor and the chassis or shell. I have done this and it results in a very quiet running loco but I now choose not to resort to this for the sake of authenticity. To me, Treble-O-Lectric should SOUND like Treble-O-Lectric, right? Any squealing or other harsh type sounds indicate a dry bearing someplace, especially the motor bushings, and should be attended. Lubricating will usually fix it. It is possible for the Television Interference Suppressor to be positioned too high and it can rattle against the loco shell or cover when it is installed, particularly in the 0-8-0 where clearence is at a premium. The best position is one as low as possible without interfering with the front inner driving band on the motor shaft. It's just about right when the upper side of the suppressor is just below the top of the motor end covers. As I stated above, the motors are pretty robust and don't normally get anywhere near hot enough to cause damage. They can usually be run for hours and just get barely warm to the touch if everything in the loco is OK. Even if the driving wheels are spinning in an effort to move a too heavy load, the motor will just keep spinning them without protest. Maybe a little more heat generation. If excess heat is apparent, however, it indicates either excess load on the motor caused by too much friction somewhere in the mechanism or the motor magnetic field has become weakened so that the armature requires more current to turn within the field. The former situation requires inspection of all driving parts to ensure free movement. Of course, the latter instance is usually caused by the dreaded "taking-the-magnet-and-pole-pieces-apart" syndrome as I have mentioned elsewhere. The magnetic field normally won't just weaken on its own through the passage of time. It takes being struck very forcefully with, say, a hammer or a lot of heat (enough to destroy the rest of the motor) to affect the field strength. So, if a weak magnetic field is indicated, the motor will have to be re-magnetised (see "Special Note about Remagnetisation" below). Disassembly is fairly straightforward. The diecast shell is held to the chassis with two screws from underneath at diagonal corners at the front and rear on the American F7s and the British D.5900 or two screws on either side of the chassis behind the "fuel tank" on the D.5000. Remove these two screws and the shell will lift off. The motor and drive will now be exposed for service. Remove the driving bands by hooking them with a suitable tool. I have found that a round wooden toothpick works well for this. The bands won't slip off the ends like they can with a metal tool. The motor shaft must be slightly raised to get the two inner bands off, of course, and the two outer bands must be removed before the inner bands. The driving wheels will be free to fall out as the bands are removed. The motor will also now be relatively loose in the chassis, held only by the motor leads. A note of interest here is that, if you grasp the motor and "swing" it from side to side, you will find that the motor doesn't rest on the bottom of the "fuel tank" at all but is suspended by the shaft between the two chassis support/bushings. Although the wire leads can be detached from the bogies (trucks) by loosening the attaching screws, I have found it easier to leave these as they are and unsolder the leads from the motor at the T.V. interference suppressor if you don't intend to remove the bogies. Each pair of leads on a side are actually one wire with insulation removed at the point of soldering to the suppressor so, if you want to completely remove the bogies, the leads will have to be detached from at least one of the bogies or the leads cut at the solder junction. Of course, if you don't have access to a soldering iron or don't have the necessary soldering skills to do this, the only option would be to detach them from the bogies but it isn't real easy to get them back into position under the brass washers when reassembling the locomotive. The motor can now be lifted from the frame for service. Be aware, as you remove the motor, that the two shaft bushings on the chassis supports may be loose and can fall out. I don't know what the reddish adhesive Lone Star used was but it wasn't totally effective as I remember even years ago that sometimes these bushings weren't secured. Of course, if these are lost, the locomotive is useless because they are essential to support the shaft and motor. The bushings can be reattached by cleaning out the pockets in the supports, applying a little ACC adhesive (superglue) to the pockets, and reinserting the bushings. There were three ways Lone Star attached the bogies to the chassis. The first was with brass screws through the bolster. The second was by the bogies being mounted on pins and held in place against the chassis by the driving bands. The third way was by pins with hollow ends through the holes in the bolsters and the ends swaged over similar to the bogies on rolling stock. In the first case, the bogies can be removed by unscrewing the brass screws in the middle of the bogies on the bottom. In the second case, the bogies will be loose already when the driving bands are removed. In the third case, the bogies cannot be removed without altering the swaging either by drilling it off or partially drilling and bending the swaged metal up. The bogies themselves can be further disassembled by removing the two brass screws at the center sides from the top. However, this should seldom be necessary for normal service. This might be a good place to mention something I have noticed with some of the diesel bogies. The coupler assembly is a plastic moulding held between the ends of the metal bogie sides. This moulding is sometimes too wide and can hold, or attempt to hold, the two bogie sides too far apart at its end. The two sides should normally be perfectly parallel so that the side play is the same for both wheel sets. On the F7s and some of the British diesels, the distance the sides can spread at the coupler end is limited by a plastic spacer at the other end of the bogie (some British diesels with "short" bogies don't have this spacer) so the coupler moulding will bow up when the limit is reached. If you notice either the bogie sides not parallel or the coupler moulding bowed up, the bogie will have to be disassembled and some material removed from the rear sides of the moulding until it fits properly between the bogie sides. Get the bow out of the moulding first by heating slightly and straightening it. Use either a file or a motor tool to remove plastic evenly from both sides in the area behind the coupler loop (bar). You will easily see how this fits between the recesses in the bogie sides. If this is done carefully, there will be no appearance alteration to the locomotive at all. The spacer on the F7s or long-bogied British diesels can be used as a guide to judge how wide to make the coupler moulding. On the short-bogied British diesels, you will have to either measure or eyeball it. Detach the locomotive from the tender by removing the brass screw at the bottom rear of the locomotive that attaches the drawbar. The locomotive can be further disassembled by removing the brass screw holding the driver retaining plate onto the bottom and removing the plate. The drivers can now be lifted out and the driving rods can be removed from the rear driver pair by pulling out the small pins. Lift the simulated coal load/cover from the tender body by hooking a finger under it at the front and pulling up. The driving bands can now be removed similarly to the diesel engines (a little tighter space in which to work though). Desoldering the wire motor leads at the T.V. interference suppressor is about the only practical option here because the wires are also soldered at the bogies instead of screws used as in the diesels. In fact, if I were to have to remove the bogies, I would cut the leads at the suppressor after desoldering rather than try to desolder the leads from the bogies. Actually, I'm not sure, but the leads in the 0-8-0s may have been four separate pieces of wire to begin with. I can't remember the situation as it was the first time I disassembled mine back in the ancient time. Again, quarters are closer than with the diesels because the tender sides are there. Soldering or desoldering at the bogies is not a good idea because the upper frame of the bogies is plastic and will warp easily from the heat. If it is ever necessary to do any soldering here, it must be done very quickly. The motor may now be lifted from the tender body/frame for service. The bogies will simply pull away from the tender because they are merely positioned on cast pins extending down from the tender frame instead of being screwed on as with most diesels. Install a "keeper" across the two magnet pole pieces at the top of the motor before withdrawing the armature from the motor. A keeper is a ferrous piece of metal that will keep the magnetic field intact while the armature is out. This is important so the field is not weakened which will cause higher current draw once the motor is reassembled. Although there is some disagreement as to whether this really makes that much difference and it may not, since it's an easy thing to do, better to err on the safe side. Keep this in place the whole time that the armature is out of the motor. The rear cover/bushing housing can now be removed by unscrewing the long brass screw toward the bottom holding the two covers together. Watch for any washers present. In the one I took apart to write this treatise, there was a thin plastic washer against the bushing in the rear cover and a brass washer next to this against the plastic armature coil winding form. They may stay with the armature or the bushing as you remove the cover. Remove them, and keep them in a safe place so they are not lost. Withdraw the armature from the front cover/bushing housing. There is a very thin plastic washer at the commutator end of the armature. Watch that this doesn't get lost either. The front cover can now be removed from the magnet/pole piece assembly and the motor brushes withdrawn from their holes in the cover. This is the extent to which the motor should normally be disassembled. As I discussed on the main Treble-O-Lectric page, do not dismantle the magnet/pole piece assembly because it will seriously weaken the magnetic field and the motor will not perform well at all after reassembly. Of course, if you have access to a re-magnetiser, you can disassemble these pieces but it normally would never be necessary to do so. The flat brush springs and T.V. interference suppressor may be removed from the front cover by unscrewing the two nuts that attach them. This is, again, not normally necessary unless the brush springs are damaged or bent and need straightening or replacement. First, clean all the parts with a suitable solvent. Do not use anything that will attack the plastic parts of the motor or the armature windings. 90% isopropyl alcohol works fairly well as does denatured alcohol. You can use mineral spirits (paint thinner) but it must then be completely removed, especially from the flat copper commutator segments at the front of the armature. The segments must be free of any foreign material or unsatisfactory performance at the brush/commutator segment interfaces will result. Remember to clean the motor brushes. Do not use mineral spirits on these as it will soak in and ruin the brushes. With the parts clean, inspect the armature. The windings should all be a kind of golden coppery colour and not burnt. They should be tightly wound on the core. There should be two wires (usually twisted together) soldered to each commutator segment, the end of one coil and the beginning of the next. The commutator segments themselves, although they may have deposits on them from the motor brushes, should not be loose, worn excessively, or damaged. Ideally, winding resistance should be checked. With all coils connected, there should be about 7.9 - 8.0 ohms of resistance between adjacent commutator segments. With any coil detached, it should measure about 12 ohms on its own. Measure between each commutator segment and the core laminations. There should be infinite resistance in each case. Inspect the armature shafts for corrosion which would be most likely to occur if the loco has been stored in a humid environment. It is undesireable since it will wear driving bands prematurely, particularly if using substitute bands like small rubber bands or latex orthodontic bands. Remove it with fine sandpaper followed by crocus cloth to polish. The shafts should be as smooth as possible for minimum band wear. Inspect the two plastic cover/bushing housing assemblies for cracks or other damage. You may also wish to check bushing wear by temporarily inserting the armature shafts into their respective bushings. There should not be excessive play with the shaft in the bushing. What is excessive? Hard to say. It's kind of a judgment call. The motor will still function, particularly in the Treble-O-Lectric application because the shafts are also supported by the bushings in the locomotive frame. However, the motor will be noisier with excessively worn motor bushings. Inspect the motor brush springs. They should lay flat against the openings for the brushes and have a fair amount of spring tension when pushed out a little from inside the cover. They should also be fairly centered over the brush holes. Make sure they don't rub against the center bushing extension on the front cover as this will impede free movement of the springs and brushes. The motor brushes should be of adequate length. They are about 3.5mm long when new and as long as they protrude into the inside of the motor when in place and the brush springs are pushed out a bit by the armature being installed into the motor, with the brushes in place, they should be OK.
Another thing to check is the brush fit in the holes in the end cover. They should easily insert into the holes without excessive clearance and if you push on them they should be forced back toward the inside of the cover by the springs when released. I have seen brushes bind in the holes either because of being too large in diameter or because of debris between the brushes and the holes. Cleaning, of course, will usually solve the latter problem. If everything appears to be clean and the brushes still bind, the diameter can be reduced by rolling the brush between a finger and a piece of fine sandpaper. Do only a few strokes and then check the fit again. As soon as the brush fits into the hole without hanging up, stop and check to see that the brush is pushed back by the spring when you push it against the spring. It is important that the brushes be free to move in the holes as will be seen later. Detached leads from the commutator segments can be resoldered. This should be done quickly so that you don't loosen the segment from the commutator form. If the lead/s is/are too short, you may have to add some wire. If any of the coils (windings) are damaged or shorted, either to another coil or the core (grounded), the coil/coils will have to be rewound. Fortunately, unless the motor has been abused or the magnet/pole piece assembly dismantled, which would lead to excessive current consumption by the armature, this should be a rare occurance. The diameter of the coil wire is about .127mm or .005". It appears to be enameled magnet wire. I don't have it written in my notes as to how many turns per coil are required (I think it's about 200). Oh well, it can be determined by counting the turns as the wire is unwound if it is not too damaged. There may not be too many who would wish to tackle this procedure because everyone may not be as nuts as me, but it is not too difficult with practice. Of course, the commutator will have to be removed to rewind any of the coils. It is glued to the end of the plastic coil form but will usually come off with a little coaxing. Other than that, about the only other real concern with the armature is the commutator itself. If any of the segments are loose, they can be reattached with a suitable adhesive such as epoxy. Of course, the adhesive film must be very thin so that the segment lays flat against the form. If the armature windings and commutator appear to be in good shape, merely clean and polish the commutator segments with very fine grained sandpaper, finishing up with crocus cloth so that the segments are shiny. Be sure to clean the segments after this with alcohol again to remove any abrasive material. Any cracks in the plastic end covers can also be repaired with epoxy. I like to use 5 minute epoxy as it is strong enough and makes the job go faster. Be sure that any adhesive that protrudes into the motor does not interfere with the rotation of the armature. Trim it away if this is the case. If either of the two brush springs is not laying flat against the motor cover or otherwise doesn't have enough tension, remove it and bend it back into the correct shape. It will be approximately correct when, with the brush spring laying on a surface so that the mounting hole end is against the surface, the brush end will also be. In other words, both ends are in the same plane. I have attempted to show this below, looking from the side as if the brush spring were installed. Reinstall and check the tension. Reinstall the motor brushes into their holes in the front motor cover/bushing housing. When installed they should protrude some into the interior of the cover. Reinstall the front motor cover onto the magnet/pole piece assembly, being careful to not dislodge the brushes. The head of the screw that holds the magnet/pole piece assembly together must be at the right side of the locomotive when the motor is assembled or the locomotive will run in the opposite direction from what is desired. This is also the side where a spot of paint will be found which was undoubtedly put on at the factory for magnet pole identification. Be sure the thin plastic washer is in place on the motor shaft at the commutator end of the armature and then insert the armature into the bushing in the front cover, commutator end first. Replace any washers on the shaft at the rear of the armature and slide the rear motor cover bushing onto the armature. Seat the rear motor cover into the magnet/pole piece assembly. Reinstall the long brass screw that holds the two covers together. Do not tighten this screw too much or the covers will crack. Just snug it up and reseal with a dab of paint (as was done at the Lone Star factory) or superglue. The keeper may now safely be removed from the two pole pieces. This would be a good time to check that the screw holding the magnet and pole pieces together is still tight. Lubricate the two shaft bushings with a light oil such as LaBelle 108 or 107. 107 is a little heavier viscosity. As usual, don't over do it. Connect the motor to a power source and it should run smoothly and steadily. While the motor is running, observe the two brushes. They should spin while the armature is turning. This keeps the brush wear even and is why it is important the brushes be free to move as I stated above. If they don't spin, it is usually due to the brush springs not being true with the flat surface of the brushes or the mating surface of the brushes themselves not being perpendicular to the brush sides. Although the motor will run satisfactorily even if the brushes don't spin, the brushes will wear unevenly and may cause poor performance in the future. These are about the only other part of the locomotives which may need service (other than replacing the driving bands, of course). With age, the brass wheels have a tendency to become loose in the plastic axle between them. This, of course will result in poor pulling capability as the wheels slip in the axles. I reattach them with a bit of superglue. Speaking of axles, a problem I encountered recently when running some of my locomotives anti (counter)-clockwise was a slowing down or even stalling in the bends. When I looked closely as this was happening, it was apparent that one of the driving bands was trying to climb off of the axle and onto the brass wheel! On one locomotive, it was the second set and on the other it was the third set. I compared these to other sets and it was obvious that the axle surface of the problem sets was very shiny. I roughed it up a bit with some sandpaper and this cured the problem. I have come to realise this is mainly caused by driving bands too thick in cross-section and also, I have always mainly operated trains in a clockwise direction so the problem wouldn't have had a chance to reveal itself. Why only anti-clockwise and why only the second and third driver pairs? The answer is in the way the bogies swing in curves and the movement of the bands along the axle. When the locomotive enters a curve, the bands move from being fairly centered on the axles toward one side or the other. This is a result of the band trying to stay centered under the motor shafts which, of course, can't move laterally. The bands on the second and third axles will move toward the left side of the axle in this particular situation as the bogies swing to the right at these locations. It can happen that the bands end up right against the wheels on the left side of the bogies. If there is enough friction between the inner side of the wheel and the band, and being that the leading side of the band is the one against the wheel, the band can be dragged off from the axle and it may continue to try and move farther left (over the wheel). I'm sure that when I roughed up the surface of the axle, the friction between the band and axle was restored enough to make the bands follow the axle instead of the side of the wheel. Also, as I stated above, this only occurs with certain bands. I know the originals are a bit stiffer than some of the replacements I have used and probably wouldn't be as likely to be stretched as easily. The originals are also thinner in cross-section from the inner diameter to the outer so there wouldn't be as much surface area presented to the side of the wheel (hence, less friction). As to why this has never happened with the first and fourth pairs when running clockwise, I don't know because it certainly would be possible as the bogies swing the other way. If you are interested in restoring the appearance of the brass wheels or other brass parts, they can be polished to remove oxidation with a liquid polish such as "Brasso". I have done this in the past and it truly makes the engine look brand new, even though it doesn't last a very long time because the brass will reoxidize. Before reassembly, clean all the mechanism parts with a suitable solvent (alcohol), especially the driving wheel journals and motor shaft support bushings. Also, clean the driving bands if you are not installing new ones. Before installing the motor, clean the two motor shafts one more time with alcohol and avoid touching them after this. We want the shafts to be absolutely clean for maximum friction with the driving bands and finger oil will not help. The next step will depend on if/how you decided to remove the wire leads and/or bogies. If these were all left in place, nothing need be done. If the bogies were removed for cleaning or repair and the motor leads left on the motor, there are some options. With the F7s and British diesels with short bogies or small fuel tanks, it is possible to attach the bogies to the frame first (leaving the two side screws slightly loose), lower the motor into position, and then work the wires under the washers by turning the bogies to one side or the other and tightening the screws. The other way is to lower the motor into position with the bogies unmounted, guiding the leads through the inner frame openings, working the wires under the washers (while holding the motor/frame and bogies), tightening the screws, and then attaching the bogies. With British diesels having long bogies and large fuel tanks, you may have to use the second option because the bogies might not turn to the sides enough to allow the side screws to be exposed after the bogies are mounted. As I said above, this is not the easiest thing in the world to do but comes easier the more you do it. Pin mounted or swaged bogies may be done similarly depending on the application. Of course, if you decided to cut the leads at the suppressor, you can attach them to the bogies first, guide the leads up through the frame openings as you attach the bogies, and resolder them at the motor. It's a bit of a trick to get both front and rear leads resoldered without one popping away as you try to solder the other. If you left the bogies and leads in position, lower the motor into position in the frame recess, brushes forward. Resolder the motor leads to the T.V. interference suppressor leads. This next step involves two options also. You can either lubricate the driving wheel axle ends with a light grease before insertion into the bogies or after all axles are installed. I prefer the second method because the bottoms of the wheel journals are open, making it fairly easy to get in there with grease, and it precludes getting any grease on the driving bands while installing the wheels. I use LaBelle 106 grease with teflon and highly recommend it. Hopefully, this is available in England, Europe, and the rest of the world but if not, I'm sure there are equivalents. Reinstall the driving wheels and driving bands, inserting a wheel with the band around the axle and stretching the band over the motor shaft. The inner wheels must be installed first on each end, of course. Be sure to get the bands all the same way so the wheels all rotate in the same direction. The illustration below from page 9 of the Treble-O-Lectric instruction manual shows the correct way to install them. I have always just remembered that the left side of each band is toward the front of the locomotive. Apply a small dab of grease on each of the two motor shaft support bushings extending up from the frame. Use very little lube here as we don't want it to get on the driving bands. Do a final inspection to be sure the wire leads are not touching the drive wheels or driving bands and that the T.V. interference suppressor is positioned correctly (see "Symptoms and Troubleshooting" above). rather than along the outside of the pole pieces as with the F7. The rear leads in the D.5000 must be routed like those in the D.5900 too because they must go between the two cast "posts" into which the holes are drilled for the mounting screws. Also make sure that the two wires lay straight across and don't dip down to rub on the armature. If there is any force at all needed to get the shell all the way down, it is a sure sign of interference somewhere which must be corrected. If not, there will be pressure placed on the two chassis and motor shaft bushings (from the downward force placed on the motor) and, not only will the locomotive run poorly with increased current draw, the bushings will be worn out prematurely. Redress the wires until the shell easily fits. Enjoy the sight of your freshly serviced loco whizzing along the track! As with the diesels, clean the remaining parts of the mechanism before assembly. Begin by lowering the motor into the recess in the tender body/frame, brushes forward. Reinstall the two bogies over the bosses on the underside of the frame with the motor leads guided up into the motor area. Resolder the leads to the T.V. interference suppressor leads. This next step involves two options. You can either lubricate the driving wheel axle ends with a light grease before insertion into the bogies or after all axles are installed. I prefer the second method because the bottoms of the wheel journals are open, making it fairly easy to get in there with grease, and it precludes getting any grease on the driving bands while installing the wheels. I use LaBelle 106 grease with teflon and highly recommend it. Hopefully, this is available in England, Europe, and the rest of the world but if not, I'm sure there are equivalents. Reinstall the tender simulated coal load/cover by pushing it straight down into the tender body. If the drivers were removed from the locomotive, clean and lubricate the axles a little with grease and reinstall into the frame, being sure to get the pair with holes for the driving rods in the rear slot. Replace the driver retaining plate and fasten with the brass screw. Reinstall the driving rods by inserting them into the openings in the cylinder casting and attaching to the rear driver pair with the small pins. Reattach the tender to the locomotive with the shouldered brass screw. Put the loco on the track and watch 'er go! As I have mentioned elsewhere, probably to the point of everybody's shear boredom, the magnet/polepiece assembly of these motors cannot be dismantled without severely weakening the magnetic field. If you have access to a re-magnitiser, then it's not a really big deal. There was an article in the September 1972 issue of Model Railroader by Ben King about how to build a re-magnetiser from old television filter chokes. Then in the August 1973 issue, a reader wrote in to the "Mr.Clinic" section of the same magazine and told how he made one from an old induction phonograph motor. Notice that the two ends are marked N and S for north and south. The motor must be inserted into the re-magnetiser correctly or it will rotate the wrong way after magnetisation. A compass is handy for determining the poles of the re-magnetiser and motor. The N pointer of the compass will point to the S pole of the motor or re-magnetiser and the S end will point to the N poles. The motor is then inserted into the re-magnetiser with its N pole at the re-magnetiser's S pole and its S pole at the re-magnetiser's N pole and the leads touched to an automobile battery for just a few seconds and voila! Done! Of course, you have to mark the leads of the re-magnetiser too (+ and -) so the polarity is the same every time you use it. After I recharged my two rewound Treble-O-Lectric motors with this device, they were as good as new! These same type of inexpensive motors are still used today in a variety of applications like oven vent fans and the like, so they should be available.